School is back, snack time returns. Back to school shopping also means parents need to pack healthy snacks for our loved ones. “An apple a day, chases the doctor away” is a very old saying and has endured the test of time. What a better way to pack your kids, wife, or husband, a healthy snack — a fresh hand picked apple from our farm! 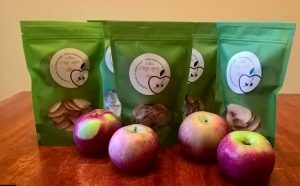 To add to their excitement, we’ve added a new item for their lunch bags: crispy apple chips. There is only one ingredient in this tasty snack: fresh hand picked apples from our farm. No sugar, nor preservatives are added. The low heat process concentrates the sugars enhancing the flavor and earthy sweetness turning our apples into healthy snack. This entry was posted in News by Jun. Bookmark the permalink.